This year’s conference was one for the books. From the beautiful setting of Virginia Beach to our compelling keynote speakers, everyone had a wonderful time connecting with the SCI network on the shared topic of citizen diplomacy and strengthening local programs. Read below for the best moments from the conference, and be on the lookout to register for next year’s conference in Aurora, Colorado. The first day of the conference began with an annual tradition: the Sister Cities International Parade of Flags. Led by mounted patrol, students from the Youth Leadership Summit carried city flags donated by over 120 member cities around the world through the Virginia Beach Convention Center. The flags were then displayed on stage as President & CEO Mary Kane began the Opening Ceremony, showing the diversity of cities that take part in the Sister Cities International network. After a beautiful rendition of the national anthem by a local Virginia Beach student and an invocation, remarks were given by Mary Kane; SCI Board Chairman Tim Quigley; Russell Held of the Port of Virginia; Chair of the Board of Virginia Beach City Public Schools Beverly Anderson; and Mayor of Virginia Beach Will Sessoms, welcoming the attendees to Virginia Beach and sharing their excitement for the days ahead. There were three keynote speeches during this year’s conference including a keynote by Khaled Sedrak of NxtVn Group; a breakfast keynote Foreign Diplomatic Corps Panel moderated by Mary Kane and paneled by H.E. Ambassador, Stanislav Vodovic, Embassy of the Republic of Slovenia; and Typhaine Biard-Hamon, Head of the Office for Cooperation with Civil Society Organizations, Embassy of France in Washington, DC. On Saturday, Karim Wasfi, renowned cellist and conductor as well as founder of the Peace Through Arts Global Foundation, led the keynote luncheon. Khaled Sedrak spoke about the increasing importance of digital infrastructure via data centers and sub-sea cables and it relates to advancing citizen diplomacy efforts all over the world. His message really hit home for many of our members, some of whom already use virtual exchanges and digital resources to strengthen their sister city relationships. The Foreign Diplomatic Corps Panel included a panel of embassy officials moderated by SCI President & CEO Mary Kane on the importance of sister city relationships and subnational diplomacy for bilateral ties with the U.S. The panelists discussed opportunities for a future of strong, impactful sister city relationships. The panel also included a moving speech from Dr. Hiroyuki Hamada, the designated representative of the Virginia Beach-Miyazaki, Japan Sister Cities relationship. Karim Wasfi began his keynote with a live cello performance. He then spoke with the audience about the importance of mutual understanding across cultures to create capacity building and business development. More importantly, he shared that creating cooperation and understanding across cultures can serve as a preventative and practical approach to radicalization. Wasfi personally uses music as a form of therapy to combat intimidation in Middle Eastern communities by radical groups. The audience found him captivating — especially the Youth Leadership Summit students who were thrilled to hear him play and speak. Sister Cities International and the City of Virginia Beach welcomed conference attendees at the Sister Cities International Beach Bash. The City of Virginia Beach hosted the event at Neptune’s Park, right on the ocean in full view of the iconic Neptune Statue. Food stands from several of Virginia Beach’s Sister Cities were serving up traditional foods from each country while attendees mingled and enjoyed the ocean breeze. Best of all, a performance by the Original Rhondels had everyone up and dancing following some great performances by local dance groups. This year’s conference featured dozens of experts in the fields of diplomacy, cities, international affairs, and more. Attendees had the opportunity to attend more than a dozen sessions on the topics of digital infrastructure, building local partnerships, youth engagement, developing arts & culture programs, peer-to-peer fundraising, and municipal department exchanges. There was something for everyone, and everyone came away with knew knowledge to share with their local programs. The Sister Cities International network of members elected one new board member and re-elected four board members during the 2017 Annual Business Meeting. In addition, Tim Quigley, Chairman of the Board of Directors, appointed two at-large board members. The newly elected at-large Board of Directors member is David Cortese of San Jose, California. The re-elected members are Presley “Lee” Guio of Union City, California; Steve Kalishman of Gainesville, Florida; Clare Petrich of Tacoma, Washington; and Youth Representative AJ Chahal. The newly appointed members are Shin Koyamada of Los Angeles, California and Roger Lawrence of Baltimore, Maryland. Lawrence Uebner of Omaha, Nebraska was re-elected as the Board’s Treasurer, and Carol Robertson Lopez was re-elected as Secretary. This Year’s Youth Leadership Summit boasted 90 youth traveling from across the U.S. and the globe. The main event was a specialized diplomatic simulation on oceans and food safety moderated by the U.S. Diplomacy Center, but students were also able to attend speaker sessions; participate in peer collaboration; visit the beach and the aquarium; and more. Over the course of four days, students learned how different national interests drive international cooperation on critical issues and gained effective problem solving strategies, leadership skills, and insights into international affairs. To learn more about what students did in Virginia Beach, check out our 2017 YLS recap here. 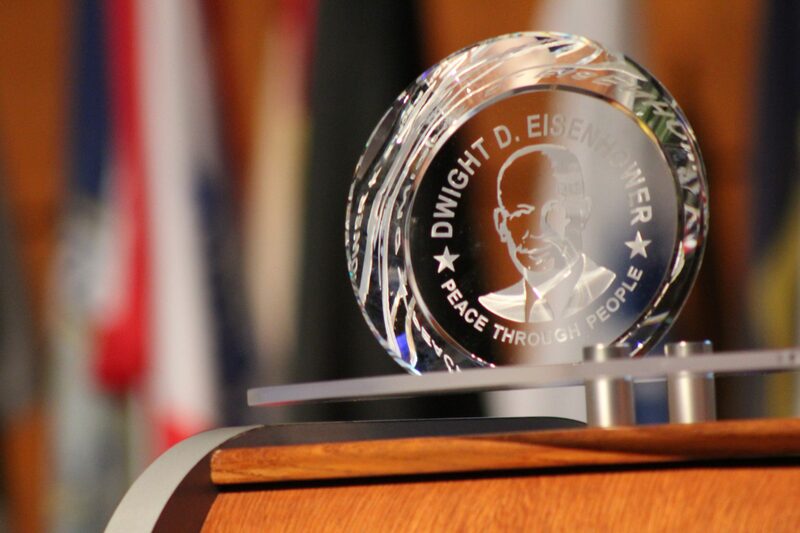 To conclude the 61st annual conference, the 2017 Lou Wozar Diplomatic Awards Ceremony and Dinner featured a cocktail reception and Annual Awards Ceremony and Dinner. The ceremony began with a thank you video from Honorary Board member and Global Envoy Thelma Press. Sister city programs from across the U.S. were then awarded for their outstanding 2016 initiatives in the categories of Volunteer of the Year, Best Overall, and Innovation (Arts & Culture, Economic Development, Humanitarian Assistance, and Youth & Education). Click here to view a list of all 2017 Annual Awards winners. Additionally, several awards were given to SCI State Representatives and outstanding folks who contribute greatly to the organization.Following the ceremony, attendees bid on over 85 items in the 2017 online auction to support Sister Cities International while students from the Youth Leadership Summit took to the dance floor with sister city program members for the final evening of the conference. No Replies to "Best Moments from the Sister Cities International 61st Annual Conference"